SCIREQ Inc.: Thank you ATS! 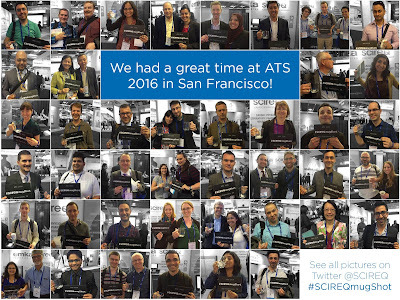 Thank you to the American Thoracic Society (ATS) conference organizers for another wonderful event! Our team is heading back to the office and are looking forward to continuing the discussion with all the researchers we met at our booth. 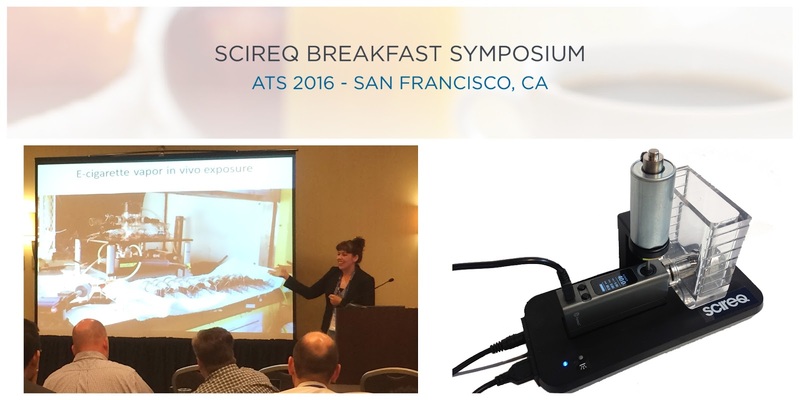 We had a wonderful Breakfast Symposium last Monday where guest speaker Dr. Laura Crotty Alexander1, SCIREQ's Vice-President Mr. David Brunet and Senior Scientist Dr. Annette Robichaud discussed what is known about e-cigarettes and what is left to be discovered and how researchers might work together towards standardization of the various parameters used to assess the impact of these devices. Many researchers gathered to share their knowledge and to begin answering some questions. Everyone agrees that more work needs to be done before we can have a clear understanding of the impact of e-cigarettes - an industry that it changing at a fast pace. The flexiVent is now capable of providing more measurements of lung volumes. The newest additions include measurements of the total and residual lung volumes (TLC/RV). As with other techniques, this is done using a computer-controlled automated manoeuvre for standardization and control of parameters. The acquisition of these new outcomes does not require the use of a separate device and can easily be preceded by comprehensive respiratory mechanics measurements typically performed with the flexiVent. Lung volume changes are sensitive to physiological or pathophysiological changes. SCIREQ's Senior Scientist, Dr. Annette Robichaud, and R&B manager, Ms. Liah Fereydoonzad, presented their poster at ATS entitled "Automated full range pressure-volume curves in mice & rats2" which found that the automated method of constructing full range PV curves in mice proved to be equivalent to the classic, manually operated, syringe pump method. The automation of the technique alleviates some of the weaknesses of the classic technique while bringing simplicity and standardization. To learn more on the flexiVent and the lung volumes technique, visit our website at www.scireq.com/flexiVent/lung_volumes. 1Dr. Laura Crotty Alexander is a researcher and staff physician in the VA San Diego Healthcare System and Assistant Professor at the University of California at San Diego (UCSD). She obtained her doctorate degree of medicine (M.D.) from Duke University and trained in internal medicine at the Massachusetts General Hospital. She then stayed in the Boston area and completed a Pulmonary and Critical Care fellowship training at the Harvard Medical School before moving to UCSD for a post-doctoral fellowship. She obtained a VA career development award via her research in asthma, and accepted a faculty position at UCSD in 2011. Dr. Crotty Alexander has authored many publications on electronic cigarettes and is a leader in this field of research.